Jo and Jeff are super wonderful. They are kind and genuine and their wedding was a reflection of them completely. They decided to get married at a family friend’s barn in Norfolk County, Ontario. As we walked around and explored the area together, Jeff pointed out all of the houses where various family members still lived. 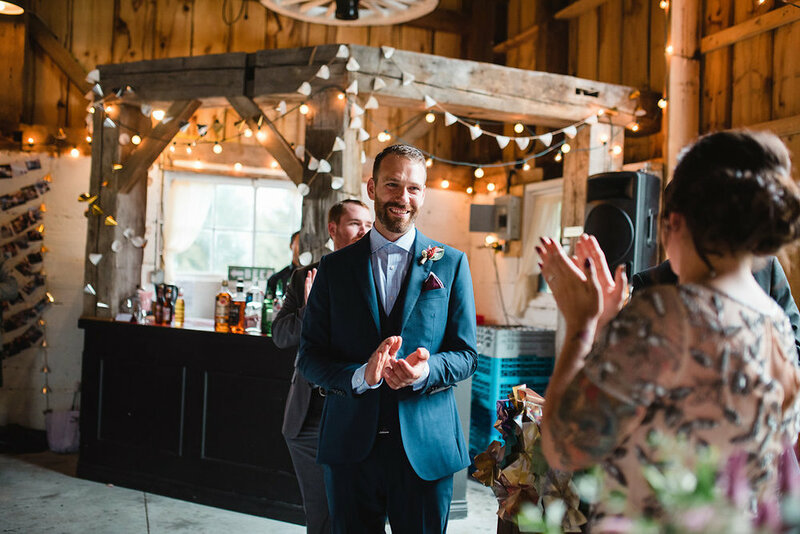 There was such a strong sense of familiarity and community around us, it was clear to me why Jo and Jeff chose this beautiful place for their celebration. Some notes from the bride “We wanted our wedding to feel like a collaboration of our friend’s and family’s talents, so we did as much DIY as possible. We even DJ’d the wedding ourselves, with a playlist that took months to make. Jeff used to work at Rotate This (a Toronto record store) and we are both big music fans, so we wanted control over what was played. Jeff’s cousin, a trained opera singer, sang ‘Fool’s Rush In’ as I walked down the aisle”. Jeff is also an origami master and his creations were used as decor all around the barn. A lot of thanks for your whole efforts on this web site. Betty delights in managing investigation and it’s really easy to see why. My partner and i know all regarding the compelling ways you make vital guidelines via this website and in addition boost participation from other individuals on this matter while our favorite simple princess is in fact starting to learn a great deal. Have fun with the remaining portion of the new year. You’re carrying out a splendid job. Thanks a lot for giving everyone remarkably nice chance to check tips from here. It is usually so fantastic and also jam-packed with a great time for me personally and my office peers to visit the blog not less than 3 times weekly to study the latest issues you will have. Not to mention, I’m just actually satisfied for the cool things served by you. Some 2 facts in this post are undeniably the best we have all had. Thanks for all your valuable work on this website. Gloria really loves managing internet research and it’s really easy to see why. Most people learn all concerning the powerful way you provide worthwhile things through this website and therefore welcome participation from other people about this area and our princess is actually understanding so much. Take pleasure in the remaining portion of the year. You are conducting a useful job. I wanted to put you a tiny remark in order to thank you so much once again for your spectacular solutions you’ve provided on this website. It was strangely open-handed of people like you to supply easily just what numerous people could have advertised for an e book to earn some bucks on their own, and in particular now that you might well have done it in case you desired. Those things as well worked like a fantastic way to understand that someone else have the identical zeal really like my very own to know a good deal more with regards to this issue. Certainly there are many more fun occasions ahead for individuals who scan your site. My husband and i felt so thrilled Albert could finish up his researching because of the ideas he gained through your weblog. It is now and again perplexing just to find yourself giving away techniques some people might have been selling. And we do understand we have the blog owner to give thanks to for this. These explanations you have made, the straightforward site menu, the relationships you aid to promote – it is everything incredible, and it’s really helping our son and the family imagine that that subject is fun, and that is really important. Many thanks for the whole thing! A lot of thanks for all your hard work on this blog. My mom loves carrying out internet research and it’s easy to understand why. My spouse and i learn all concerning the dynamic tactic you convey vital solutions through this website and in addition attract contribution from people on the situation and our daughter is always studying a great deal. Enjoy the remaining portion of the new year. You’re performing a splendid job. I simply had to thank you very much once again. I do not know the things that I could possibly have followed in the absence of the type of thoughts documented by you over such a subject. It had been a real depressing crisis in my opinion, nevertheless being able to see your specialised manner you handled it forced me to jump with joy. Now i am happy for your help and even expect you comprehend what a great job that you are putting in educating many people by way of your web site. I know that you’ve never come across any of us. Thanks so much for providing individuals with an exceptionally special chance to read articles and blog posts from this blog. It really is very great and also jam-packed with a good time for me personally and my office friends to search the blog minimum three times per week to read through the latest guidance you will have. Of course, I’m usually impressed with all the staggering concepts served by you. Selected 2 areas on this page are clearly the most suitable we have ever had. I would like to express my appreciation to the writer for rescuing me from this particular dilemma. As a result of browsing through the world-wide-web and seeing thoughts which are not powerful, I figured my life was gone. Living without the approaches to the issues you have resolved by way of the short post is a serious case, as well as ones which could have negatively damaged my career if I had not noticed your web page. Your personal know-how and kindness in controlling all the pieces was excellent. I am not sure what I would have done if I hadn’t discovered such a step like this. It’s possible to at this time look ahead to my future. Thanks for your time very much for your high quality and amazing help. I will not think twice to suggest the website to anyone who should have guide about this subject. My husband and i ended up being happy when Michael managed to carry out his inquiry through your precious recommendations he had from your web page. It’s not at all simplistic just to be making a gift of key points which often other folks could have been making money from. Therefore we grasp we have got you to be grateful to for this. Most of the illustrations you made, the simple blog navigation, the relationships you help to engender – it’s all astounding, and it is aiding our son and us know that this issue is excellent, which is certainly wonderfully vital. Many thanks for the whole lot! I and my guys were examining the best pointers from the blog and quickly came up with a horrible feeling I never thanked the web blog owner for those secrets. All the women happened to be thrilled to see all of them and already have pretty much been making the most of them. Appreciate your turning out to be simply kind and also for having variety of superb subjects most people are really desperate to know about. My honest regret for not saying thanks to you earlier. I am glad for writing to make you be aware of what a amazing encounter my wife’s princess encountered checking yuor web blog. She learned many details, including what it is like to have a wonderful giving style to have many more without problems master several specialized topics. You undoubtedly did more than our expected results. Thanks for displaying the warm and helpful, dependable, informative as well as unique tips on this topic to Lizeth. I’m also commenting to let you know what a really good discovery my cousin’s girl gained studying your webblog. She discovered several things, which include what it’s like to possess an awesome helping spirit to have most people with no trouble gain knowledge of specific multifaceted matters. You undoubtedly surpassed our desires. Thanks for presenting the beneficial, safe, revealing and easy tips about your topic to Gloria. I am glad for commenting to make you be aware of of the magnificent encounter my cousin’s girl undergone reading through your blog. She discovered some things, which included what it’s like to have a great teaching heart to get the mediocre ones clearly know precisely a variety of tricky things. You truly did more than visitors’ expectations. Many thanks for offering these necessary, dependable, edifying and as well as fun thoughts on your topic to Emily. I enjoy you because of each of your hard work on this blog. Gloria loves working on research and it is easy to see why. Many of us know all regarding the compelling medium you deliver vital items on your blog and in addition cause contribution from some others on the area of interest plus our own simple princess is without a doubt being taught a lot. Take advantage of the remaining portion of the year. You are always doing a fabulous job. Thanks a lot for providing individuals with an exceptionally breathtaking possiblity to discover important secrets from this site. It can be very brilliant and as well , stuffed with a great time for me personally and my office peers to search your website really three times weekly to see the latest secrets you have. Of course, I’m certainly pleased concerning the beautiful points served by you. Some 4 tips on this page are clearly the finest we’ve had. I simply wanted to post a brief remark in order to thank you for the pleasant tips and tricks you are writing on this website. My incredibly long internet investigation has now been paid with good quality know-how to go over with my colleagues. I would admit that most of us readers are rather fortunate to live in a really good website with so many outstanding people with great basics. I feel extremely grateful to have encountered the website page and look forward to so many more pleasurable moments reading here. Thanks a lot once again for a lot of things. I happen to be writing to let you understand what a awesome experience my child developed studying the blog. She picked up so many pieces, which included what it is like to possess an amazing giving heart to have other individuals completely fully understand a variety of problematic matters. You undoubtedly did more than visitors’ desires. Many thanks for providing these precious, safe, explanatory and even easy thoughts on the topic to Sandra. I together with my buddies were actually reading through the nice pointers from your web site and so the sudden developed an awful suspicion I had not thanked the web site owner for those strategies. All the young boys appeared to be for that reason excited to study them and have in truth been taking pleasure in these things. Many thanks for being well considerate and then for making a decision on such ideal information most people are really eager to know about. Our own honest apologies for not expressing gratitude to you sooner. I am just writing to let you be aware of of the awesome encounter my girl enjoyed reading yuor web blog. She figured out lots of things, which included how it is like to have a marvelous teaching mindset to make the rest with ease comprehend several complicated subject matter. You undoubtedly surpassed readers’ expected results. Thank you for producing the warm and helpful, safe, educational and in addition cool thoughts on that topic to Jane. I want to express thanks to this writer just for bailing me out of this difficulty. As a result of looking out throughout the search engines and coming across concepts which are not productive, I figured my entire life was well over. Living without the solutions to the difficulties you have sorted out as a result of your article content is a crucial case, as well as the ones that could have badly damaged my career if I hadn’t noticed the website. Your good mastery and kindness in maneuvering a lot of things was useful. I don’t know what I would have done if I hadn’t come upon such a solution like this. I am able to at this point relish my future. Thanks for your time so much for your expert and result oriented help. I won’t hesitate to propose your site to anyone who will need support about this matter. I want to show my thanks to this writer for bailing me out of such a condition. Because of exploring through the internet and coming across principles which are not helpful, I figured my life was well over. Living without the strategies to the issues you’ve resolved through your entire guide is a crucial case, and the ones which might have adversely damaged my career if I hadn’t come across your blog. Your good understanding and kindness in taking care of everything was tremendous. I’m not sure what I would have done if I hadn’t come upon such a thing like this. I am able to at this moment relish my future. Thanks a lot very much for this specialized and sensible help. I will not be reluctant to refer the website to anyone who should get counselling on this issue. I am commenting to let you know of the extraordinary encounter my cousin’s princess found checking yuor web blog. She mastered a wide variety of details, most notably what it is like to have a great teaching heart to have the others effortlessly understand some impossible subject matter. You undoubtedly surpassed my desires. Thanks for producing those helpful, dependable, edifying and even fun thoughts on this topic to Ethel. I enjoy you because of all your efforts on this site. My aunt really likes going through internet research and it is easy to understand why. I notice all of the dynamic tactic you make important guidance by means of the web site and as well boost contribution from the others on the theme so my girl has been discovering a lot of things. Take advantage of the rest of the new year. You are always carrying out a splendid job. I precisely wished to say thanks all over again. I’m not certain the things I might have done in the absence of the actual recommendations revealed by you relating to such theme. It truly was an absolute hard situation for me personally, nevertheless seeing the professional tactic you solved that took me to leap for gladness. Now i am thankful for this assistance and then expect you comprehend what a great job you are always providing instructing many people using your webpage. More than likely you have never encountered all of us. I really wanted to send a quick message in order to express gratitude to you for some of the nice guides you are giving at this website. My particularly long internet investigation has at the end of the day been honored with reputable concept to share with my family. I would mention that most of us visitors actually are quite lucky to be in a perfect site with very many lovely professionals with helpful solutions. I feel very privileged to have discovered the weblog and look forward to plenty of more fabulous minutes reading here. Thanks once more for all the details. Thanks so much for giving everyone an exceptionally pleasant opportunity to read in detail from this site. It is always very awesome plus packed with fun for me personally and my office fellow workers to visit the blog at a minimum thrice in a week to find out the new stuff you have got. Not to mention, I’m certainly pleased with the unbelievable guidelines you serve. Some two tips in this posting are unequivocally the finest I have had. I intended to send you this very little word to be able to thank you the moment again regarding the exceptional methods you have discussed in this case. It was quite pretty open-handed with you to give without restraint all that a few people might have advertised for an electronic book in order to make some money on their own, principally since you could have tried it in the event you considered necessary. Those thoughts also served as the great way to be sure that most people have the identical passion really like my own to grasp a whole lot more pertaining to this problem. Certainly there are millions of more enjoyable sessions in the future for people who browse through your site. I wanted to make a simple word to appreciate you for all of the awesome ideas you are sharing on this website. My extended internet look up has now been rewarded with good quality facts and techniques to go over with my companions. I ‘d point out that most of us site visitors are extremely endowed to be in a fantastic website with so many marvellous professionals with interesting advice. I feel extremely fortunate to have seen your webpage and look forward to many more excellent minutes reading here. Thanks a lot once again for all the details. I am just writing to make you know of the superb experience my friend’s daughter encountered reading through the blog. She learned many things, including what it is like to possess an ideal helping nature to get many more completely grasp specified complex subject areas. You undoubtedly did more than our own expectations. Many thanks for imparting the interesting, dependable, explanatory and also fun tips on your topic to Kate. I intended to put you the very little word to give thanks once again for those pretty tactics you have documented on this website. It has been really generous with people like you in giving easily all that a number of us would have distributed as an electronic book to generate some profit for their own end, even more so since you could have done it in the event you desired. The advice as well worked to be a fantastic way to be aware that other people have the identical dream similar to my own to figure out more in respect of this issue. Certainly there are many more pleasurable sessions in the future for many who check out your blog. I am only commenting to make you understand of the excellent encounter our child found checking your blog. She picked up lots of pieces, with the inclusion of what it is like to possess an excellent helping mindset to let most people with ease gain knowledge of some extremely tough subject matter. You actually surpassed my desires. Thanks for churning out the invaluable, trustworthy, informative and even unique thoughts on the topic to Sandra. I precisely desired to thank you so much yet again. I do not know what I might have undertaken in the absence of those suggestions shared by you on that field. It seemed to be a fearsome circumstance in my opinion, but seeing the very specialized technique you managed that made me to weep for happiness. Now i’m grateful for your help and in addition hope you really know what a great job you were accomplishing training men and women thru your webblog. I’m certain you’ve never come across any of us. Thanks Marianne! It was so lovely!! How cute! I want my wedding to be like that. So quiet and intimate.